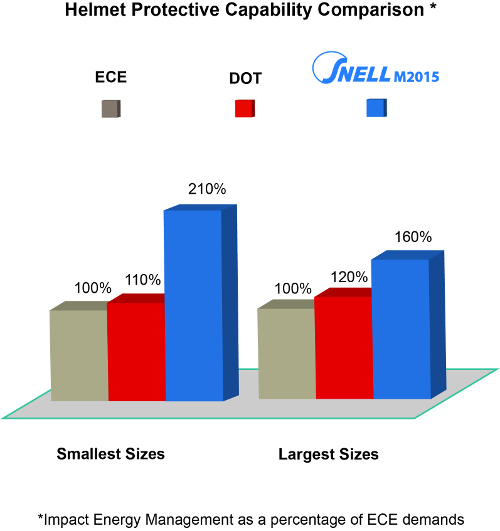 Abstract: The article compares four standards: Snell M2005, Snell M2015/M2010, DOT, and ECE 22-05. M2005 and the current DOT Standard (Federal Motor Vehicle Safety Standard 218) apply largely to motorcycle helmets intended for the US and Canada. ECE 22-05 applies to helmets for sale in Europe. M2015 is essentially the same as the previous Snell M2010. It is the current Snell motorcycle helmet standard and is intended to apply to helmets in every part of the world.